Allin Frawley, chairman of the Middleborough Board of Selectmen, said he is concerned the state’s latest plan for the South Coast Rail would provide “inferior service” to South Coast residents and “degrade current rail service” on the Middleborough-Lakeville line. A new state plan to expedite the long-awaited return of commuter rail service to the South Coast has instead become the subject of heated debate across the region, dividing even longtime advocates of the project. The project until recently featured a single plan known as the Stoughton Electric Alternative, an extension of the Stoughton line along inactive rail beds and a trestle over the Hockomock Swamp in Easton and Raynham. At Cotley Junction in Taunton, the route would follow active freight tracks, with a main branch to New Bedford and a secondary one to Fall River. But in March, state officials announced a two-phased approach in which it would use the existing Middleborough/Lakeville line to bring trains to the region on an interim basis while they continue to advance the Stoughton Electric Alternative. The interim service would end once the Stoughton extension was built. “I think there’s something in this plan for everyone to hate,” said Freetown Town Administrator Jack Healey. Those objecting to the phased approach include both South Coast officials and residents who worry it will deprive the region of the full rail service it needs, and others who fear potential adverse impact to the Middleborough/Lakeville line. 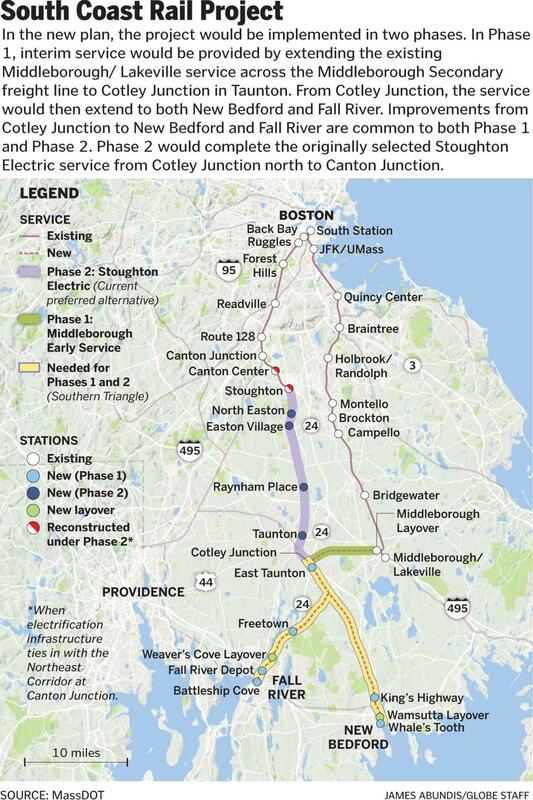 “I think this is a political decision to put this plan forward to distract attention from whether or not the South Coast Rail project is going to be done or not,” said state Senator Marc R. Pacheco, a Taunton Democrat, who wants the state to instead focus only on building the Stoughton Electric Alternative. But state Representative William M. Straus, a Mattapoisett Democrat who is the House chairman of the Joint Committee on Transportation, voiced strong support for the latest plan in a letter to state environmental officials. “As a longtime, active proponent of South Coast Rail, I believe Phase 1 realistically places rail service to Boston on a near-term horizon for the first time since 1959,” he said, referring to the year passenger service was discontinued to the region. The Phase 1 plan, currently under state environmental review, would extend the Middleborough/Lakeville line along the Middleborough Secondary -- an existing 7.5-mile freight corridor -- to Cotley Junction, from where the diesel trains would follow the same split route to Fall River and New Bedford as in the Stoughton plan. About $158 million so far has been invested in the Stoughton plan, according to Jean Fox, the state’s project manager for the South Coast Rail, and 15 percent of the design iis complete. The state opted for the phased approach after new estimates showed the project would cost about $1 billion more than the previous $2.3 billion estimated and take much longer to complete. “We met with board members of the MBTA, and they asked us to take a look and see if we could do something quicker and with less money,” said James L. Eng, deputy rail administrator for the state Department of Transportation. Officials say Phase 1 service would begin in 2022, to be replaced by Phase 2 service when it begins in 2030. Because much of the $1.1 billion Phase 1 work is also needed for Phase 2, the total project estimate is $3.4 billion. By building sooner, the state also expects to save on construction costs. As part of Phase 1 planning, the state is evaluating whether to retain the existing Middleborough/Lakeville station (located in Lakeville), build a new station in Middleborough, or do both. If no new station is built, those who board at the existing station may need to take a shuttle train and transfer at a station farther north, possibly Bridgewater. The interim line would provide about 26 daily trips between the South Coast and Boston, with two or three peak trains in each direction. The Stoughton line would offer 40 daily trips, including five peak trains in each direction. Josh Ostroff, partnership director for the advocacy group, Transportation for Massachusetts, cautioned that the Middleborough route “will only work as a short-term option” because a key section of the route is single track -- in Dorchester -- limiting how much service could be provided. New Bedford Mayor Jonathan F. Mitchell said he is “deeply skeptical” about using the Middleborough/Lakeville route because it would involve an approximately 90-minute ride, compared with the 77 minutes the state estimates for the Stoughton Electric Alternative. “We are looking at a home-to-workplace commute for most people of close to two hours, which is not something people are willing to tolerate,” he said. Mitchell also expressed skepticism that the state would actually proceed with the Stoughton plan if it builds Phase 1, a sentiment echoed by others in the region. Allin Frawley, chairman of the Middleborough Board of Selectmen, said he opposes the Phase 1 plan, which he contended would provide “inferior service” to South Coast residents and “degrade current rail service” on the Middleborough-Lakeville line. He said building the new station would also exacerbate existing traffic snarls at the Middleborough rotary. Lakeville Town Administrator Rita Garbitt said if the current train station were closed it would negatively impact local businesses and residents of the more than 200 housing units built near the station since the town adopted “smart growth” zoning for that area. Taunton officials, meanwhile, are unhappy the Phase 1 plan does not currently include the station near the city’s downtown that is part of the Stoughton plan. The only planned station, in East Taunton, is not convenient to most city residents, said Mayor Tom Hoye. But Paul Chasse, chairman of the Rail to Boston Coalition, said his group, which advocates for the South Coast Rail project, supports the Phase 1 plan because “it will cost far less and take far less time to get service down here.” He said that support is conditioned on Phase 1 service not requiring South Coast riders to switch trains -- which may not be the case if a new station is built in Middleborough to replace the existing one in Lakeville. Meanwhile, officials in Easton, Raynham, and Stoughton, who have long opposed the Stoughton extension, continue to voice their objections. Dan Murphy, chairman of the Easton Board of Selectmen, said the costs of the Stoughton plan, including the impact of seven grade crossings, outweighs the benefits for Easton. Stoughton Selectman Robert Cohn said the town continues to oppose the project because the state will not commit to depressing the tracks in the town center, and because the tracks would run close to homes, businesses, and a school. Raynham Selectman Joseph R. Pacheco said the Stoughton plan would cause “disruption to Raynham residents and businesses,” adding that if the state proceeds with the Middleborough plan it would make no sense to also spend the money on the Stoughton one.